Bynum Robert "Bob" Geer, 79, of Utica, Kentucky died Sunday, May 8, 2016, at Owensboro Health Regional Hospital. He was born May 14, 1936 in Rutherfordton, NC to the late Grady Orville and Nell Champion Geer. 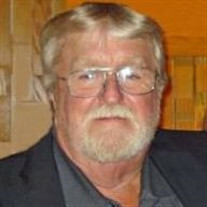 He retired as a superintendant for Road Builders, Inc. in Greenville, KY and a member of Local 181. He was a veteran of the U.S. Army. He enjoyed horses, traveling in his R.V., Nascar racing and most of all loved being a "Papa". He was preceded in death by a son, Kenny Robert Geer on April 3, 1996; and by two brothers, Max and Ott Geer. Survivors include his wife of 39 years, Janet Geer; a daughter and son-in-law, Beverly and Joe Hornback of Fishers, IN; three grandchildren, Katie, Joshua and Alyssa Hornback; a stepdaughter, LeeAnn Fischer (Allen) of Chrisney, IN; a stepson, Kriss McCormick (Julie) of Chrisney, IN; two sisters, Judy Scruggs and Lois Toney both of North Carolina; and several nieces and nephews. Visitation is from 4:00-8:00 p.m. on Tuesday at James H. Davis Funeral Home & Crematory in Owensboro. Services are 1:00 p.m. on Friday, May 13, 2016, at Mount Vernon Baptist Church in Forest City, NC with Reverend Dr. Scott Courtney officiating. The visitation will be at the church from 12:00-1:00 p.m. on Friday. Burial will follow in Mount Vernon Baptist Church Cemetery.